I was honored to be one of the Susan G. Komen Twin Cities for the Cure top fundraisers for the 2009-2018 races. The Pink Honor Roll is the group of top fundraisers from the race. Komen hosts a celebratory dinner the following March that recognizes the top Twin Cities Race Fund Raisers out of more than 50,000 fund raisers from the prior year's race. I've made the Honor Roll every year! At the 2011 race, I was the 14th highest fundraiser! At the 2014, I was in the top 10. And at the 2015 race, I raised over $6500! Each of the Pink Honor Roll members received a distinctive hat or Pink Honor Roll T-shirt (that I'm wearing in the photo below) that has all of our names on it on the back of the shirt. We are also featured on the Komen Website: www.komenminnesota.org. I was honored to have been selected to be interviewed in 2012 for the Minneapolis Star-Tribune newspaper (the largest in Minnesota) for my work with the Komen Foundation. I was also featured in our local paper and in my elementary school newsletter! 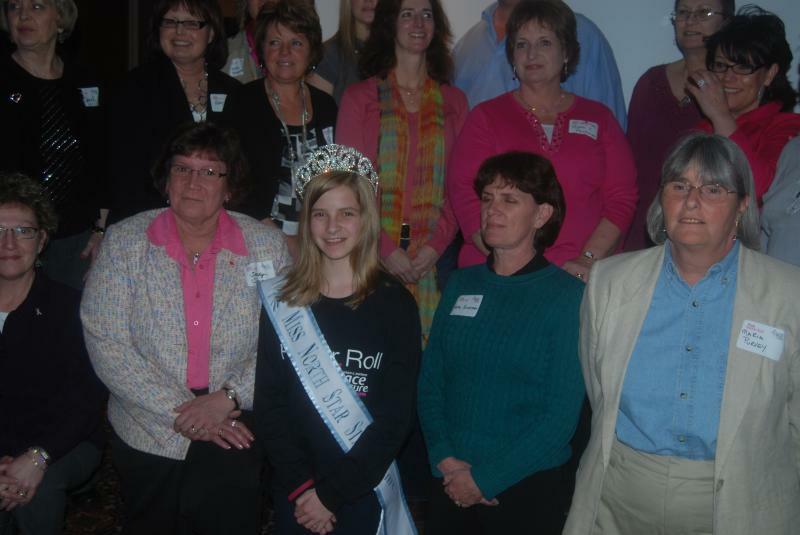 Below are photos of some of the Pink Honor Roll Fundraising Dinners over the years, and also the 2011 Race for the Cure! Our team, "Queens & Friends for a Cure" was also one of the top teams this year. If a team member didn't have a crown & banner but was a "Queen at Heart" and wanted to wear one for the race, they just borrowed one of mine! It gave a great message about queens getting involved with helping their communities! Below: At the 2012 Pink Honor Roll Banquet with emcee, Staci Matthews, from the Moon & Staci show at KS95 radio station! Below: With the other Pink Honor Roll members! Our 2011 Team "Queens & Friends for a Cure"
My friends who always wanted to be a Queen got to be "Queen for a Day"! We all came together to raise money for ths important organization. Once again, we were one of the top teams! BELOW: After celebrating at Subway, we spent the day enjoying the rides at Mall of America's Nickelodeon indoor amusement park! Two of my BFF'S, Angela & Katrina, joined me at the Fundraiser Dinner the night before the race. BELOW: My team celebrated our success after the 2011 race at Subway!